Is the work worth it? Is the Work of Recovery Worth It? Change is hard! I was reminded of this earlier today when I spoke with a friend who has been fighting his addictions for years. And I see the struggle each day as I counsel couples trying to recover from past disappointments or betrayals in their marriage. Sometimes the work of change is so difficult that they wonder if it's realistic to hope for something better. People really can and do experience satisfying changes if they have a clear sense of who they want to become and remain committed to the process. Refusing to give up is one of the things that separate those who "make it" from those who do not. The book A Million Miles in a Thousand Years by Donald Miller challenges us to turn our life stories into something truly interesting and memorable. One passage, in particular, seemed to illustrate the frustration of moving toward change. Let me share it with you. It's like this with every crossing, and with nearly every story too. You paddle until you no longer believe you can go any further. And then suddenly, well after you thought it would happen, the other shore starts to grow, and it... reaches out to you, to welcome you home, almost pulling your boat into the sand. 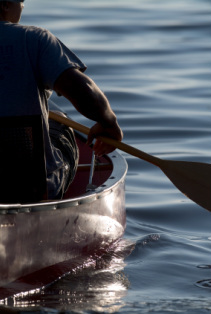 Keep paddling toward your shore. It's worth the trip.